“The door of human kindness was thrown open recently when about 100 Harford Countians banded together for a common cause and organized the Harford County Humane Society, a group of animal lovers who have pledged themselves to care for pets which are ill or who have no home,” reported The Record of Havre de Grace in June, 1948. Four years earlier in 1944, Mrs. Elsa Voss of Atlanta Hall Farm in Monkton (photo at right courtesy of The Historical Society of Harford County), led a group of friends to set up a temporary shelter for stray hunting dogs on the Albert Hughes farm just outside of Jarrettsville. Voss and her husband, Edward, moved from Long Island, NY to Maryland in 1936 to pursue horse training, foxhunting and art. Edward and Elsa owned and operated Atlanta Hall Farm in Monkton, MD where Edward served as Master of the Elkridge-Harford Hounds for more than 30 years. Atlanta Hall was also home to Belgian draft horses and purebred Angus cattle. Edward and Elsa Voss were also artists – Edward worked in watercolors and oils while Elsa sculpted horses and other animals in bronze, both as commissions and gifts for her family and friends (pictured: Morning Gallop, April 1939). 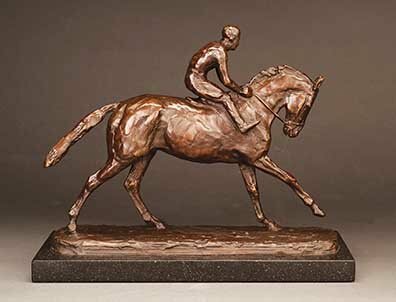 Elsa pursued her art until the very end of her life, and was working on a sculpture of Secretariat at the time of her death at age 86 on June 3, 1982. 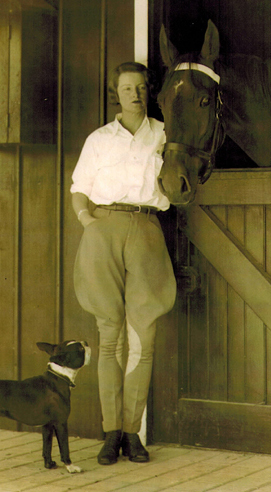 (source: Mid-Atlantic Thoroughbred and the Maryland Historical Society). Mrs. Voss spearheaded efforts to provide temporary housing for animals that once lived in comfortable homes. Many of these animals were abandoned or left as strays when their guardians were sent to war or relocated out of the area. The group also noted that adult dogs and cats roaming free in the county were reproducing at will. As the homeless animals continued to multiply and roam the county, they became a nuisance. The larger and more aggressive dogs gathered in packs and searched for food. Sheep, chicken and other tame farm animals fell prey to the packs of dogs. 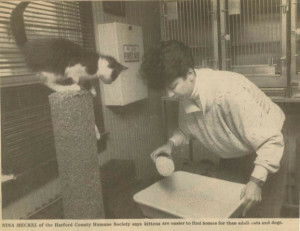 On February 5, 1946, the shelter relocated to its permanent address in Fallston, began accepting cats, and was formally recognized as The Humane Society of Harford County. 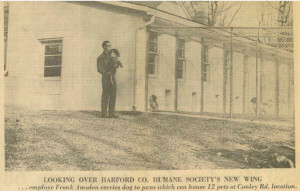 Mrs. Voss purchased a small dairy farm at 2208 Connolly Road, Fallston, and on February 5, 1946, The Humane Society of Harford County officially opened its doors. 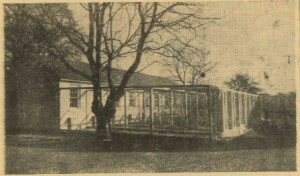 Mrs. Voss had 10 wooden dog kennels built which housed both stray dogs and cats. 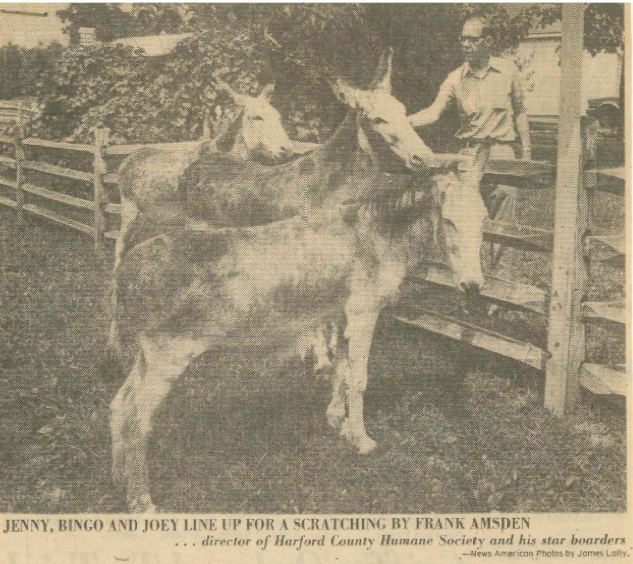 The residents of the property, Mr. and Mrs. Sid Boniface, served as caretakers and kennel workers for the facility. Her staff not only took care of the animals on the premises but also went out into the county to pick up stray and injured animals. 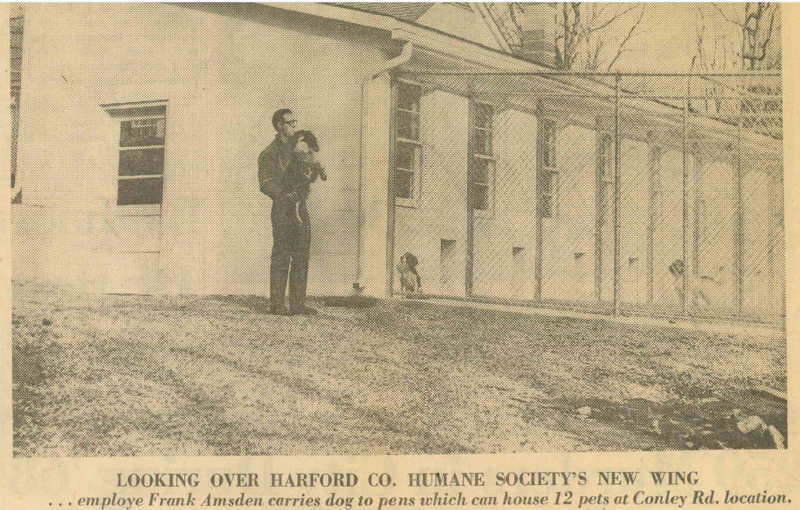 At that time, Harford County did not have an Animal Control department. 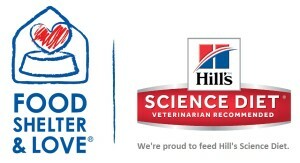 Word soon spread about the facility and more animals were brought to the shelter until it was filled to capacity. A large wooden box where unwanted animals could be placed was located at the front door of the farmhouse. 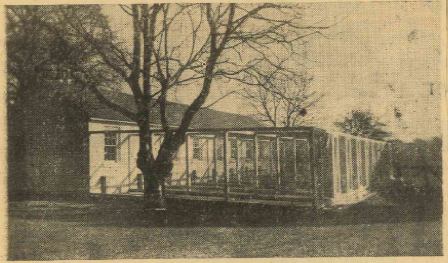 The box had windows to provide ventilation and was separated with walls. Animals were later placed in a kennel for adoption. People who adopted pets were charged between two and three dollars for each animal. 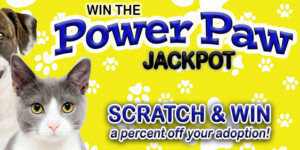 This fee also made them a member of the Humane Society. Many adoptable animals were provided care for several months. The existing wooden kennels were replaced with steel gauge kennels and 11 more kennels, with indoor and outdoor runs, were added. Heat was also installed in the kennel area under the floor to keep the animals warm in winter time. A front lobby with a reception area was added to the building. An area was desperately needed to house the chickens, ducks, peacocks, geese, etc. that came to the shelter, so in 1976 a yard was constructed to house these animals safely. For years the cats available for adoption were housed in one of the dog kennels. So in 1981 a room in the old farmhouse was converted to a cat room where cats and kittens could play freely. Over the next 12 years, the shelter saw a steady increase in animals coming in, but there was not enough space to house them all. The only building left on the property was the garage, so in 1993, the garage was converted to a stray cat holding area (years later it was converted to the Small Critter Cottage). Anyone who visited HSHC in the 80’s and early 90’s knew there were many times when the front office was full of people and animals. It was impossible to hear the phone and at times, was dangerous with too many animals entering and exiting this confined space. In 1994 the Board of Directors approved the construction of a new front office. The project was completed in the fall of 1994, and the old office was converted into two new dog kennels. Rebel’s Dog Park, a free community dog park on the grounds of HSHC, officially opens to the public. 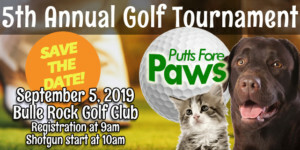 On September 4, ground is broken for the new 19,000 square foot home for Harford County’s homeless and abandoned animals. Rebel’s Dog Park closed. On February 5, HSHC celebrated its 70th anniversary. On March 28, the doors to our new state of the art shelter facility opened to the public. The old facility was razed and a large, lighted parking lot was installed. On October 22, a Grand Reopening and Ribbon Cutting ceremony was held for the new shelter, attended by local dignitaries, supporters, media, and community leaders. In January, it was announced that in 2016, HSHC had it’s highest lifesaving rate ever, with a 90.6% live release rate. 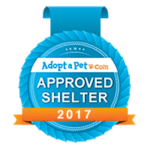 History is made again when the shelter announces a 91.55% live release rate for 2017. 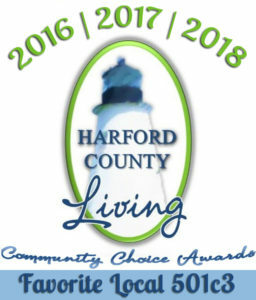 In addition, the shelter learns that it wins the prestigious Harford Award from the Harford County Chamber of Commerce for Best Nonprofit, for the first time in the history of the organization, as well as Best Charity/Nonprofit for the 5th year in a row by the readers of Harford Magazine, and Favorite Local 501c3 for the second straight year by Harford Living.